Dark January nights can often leave us craving the comfort of warming, hearty food whilst trying to stick to our New Year diet. This recipe is perfect for just that kind of event, when you fancy something packed with flavour and nice and filling but light enough to stick within your points. I have a slight obsession with lentils. I think they add the most amazing and unique flavour to a dish and always do a great job of filling you up. This week I decided to put together a new curry which could be adapted for a vegetarian or be made with fish or chicken. The recipe below therefore will tell you how to make the curry sauce itself which can be served with potatoes, chicken or fish (or anything else you fancy!). I served it with seabass for dinner and it was delicious so I’ve include the points and method for that below too. Fishcakes are something I love to have as a starter in a restaurant and are the perfect light lunch or dinner. Having not had them in a loooong time, tonight, with little else in the cupboards, I thought it was time to whip some together. Who doesn’t love guacamole. It basically a combination of all my favourite foods/flavours, avocado, lime, chilli and mexico. 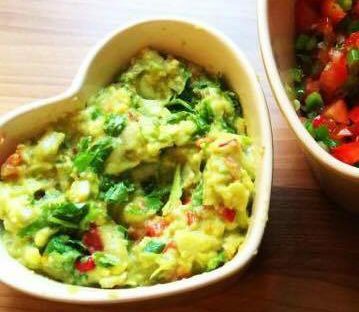 You can whip up this guacamole so quickly and whack it as an accompaniment to most dishes to up the flavour. I add a fresh chilli for some real heat but if you don’t like it too hot (or don’t have any chillies handy) it is just as good with a large pinch of chilli flakes. I keep everything nice and chunky so its got a good bite but if you prefer it smooth mash the avocado well and chop everything a bit smaller.